Home Lifestyle Health Bialy! Pancakes! Tea Cake! I rarely make pancakes, but I got a craving for some late last week. I finally got my pancake fix on Saturday morning when I made the Almond Butter Banana Pancakes from The No Meat Athlete Cookbook. These are made with whole wheat pastry flour and almond flour, and almond butter stands in for the fat (so they’re mostly oil-free except for a little spray oil on the griddle). They’re also refined sugar-free since banana provides sweetness in the batter and maple on top. I added blueberries to my batter because why not? Later that morning, I stopped by the Lulu’s booth at the Cooper-Young Farmers Market and grabbed one of Don’s vegan Caramelized Onion & Poppyseed Bialys. This savory bun made the perfect side for a salad at lunch. 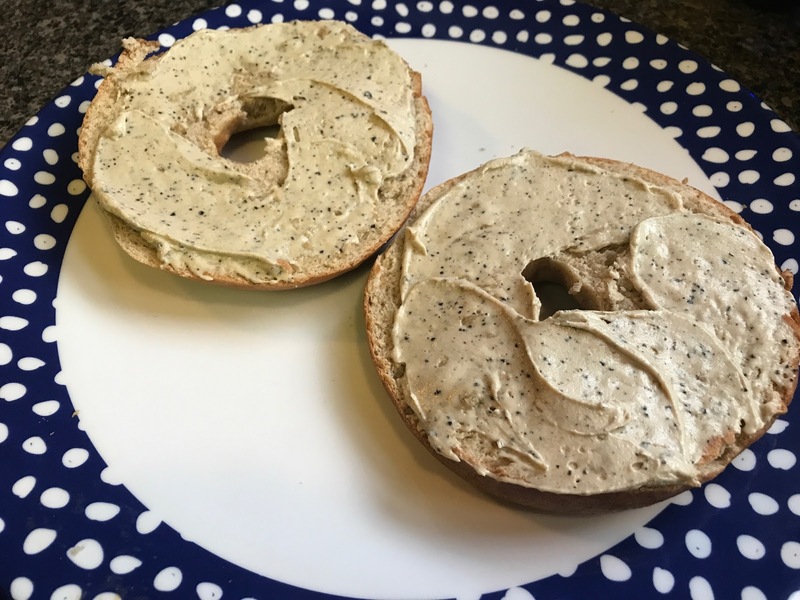 Don was also selling tubs of his cultured Cashew Coffee Cream Cheese — a vegan cream cheese made with finely ground coffee. I enjoyed some on a whole wheat Dave’s Bagel for breakfast on Monday morning (my workout rest day this week). The cream is very lightly sweetened with a strong coffee flavor. It tasted great and I felt like it gave me an extra boost! Here’s a Savory Oat Bowl from last week! With nooch, spinach, broccoli, avocado, everything bagel seasoning, and sriracha. 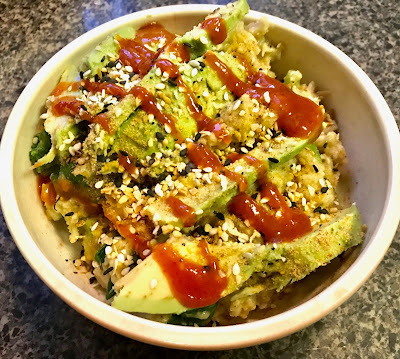 I’m such a fan of savory oats, especially when topped with ALL THE AVOCADO. And finally, here’s a moist and delicious slice of Mixed Berry Tea Cake from the cafe at Crosstown Arts. I’d brought berries from home as my afternoon snack, and when I saw this tea cake on the counter, I knew it’d be the perfect accompaniment. Enjoyed with Earl Grey tea made in the office Kerig. Happy Spring, y’all! I’ll be back tomorrow with a very vegan-eggy spring foods post!